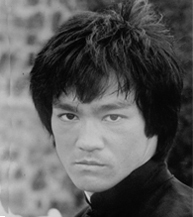 Bruce Lee (Lee Hsiao Lung), was born in San Fransisco in November 1940 the son of a famous Chinese opera singer. Bruce moved to Hong Kong when he soon became a child star in the growing Eastern film industry. His first film was called The birth of Mankind, his last film which was uncompleted at the time of his death in 1973 was called Game of Death. Bruce was a loner and was constantly getting himself into fights, with this in mind he looked towards Kung Fu as a way of disciplining himself. The famous Yip Men taught Bruce his basic skills, but it was not long before he was mastering the master. Yip Men was acknowledged to be one of the greatest authorities on the subject of Wing Chun a branch of the Chinese Martial Arts. Bruce mastered this before progressing to his own style of Jeet Kune Do. He met his wife Linda at the University he was studying. His Martial Arts school flourished and he soon graduated. He gained some small roles in Hollywood films - Marlowe- etc, and some major stars were begging to be students of the Little Dragon. James Coburn, Steve McQueen and Lee Marvin to name but a few. He regularly gave displays at exhibitions, and it was during one of these exhibitions that he was spotted by a producer and signed up to do The Green Hornet series. The series was quite successful in the States - but was a huge hit in Hong Kong. Bruce visited Hong Kong in 1968 and he was overwhelmed by the attention he received from the people he had left. Back in Hong Kong producers were desperate to sign Bruce for a Martial Arts film, and it was Raymond Chow the head of Golden Harvest who produced The Big Boss. The rest as they say is history. Read the chronological time life of Bruce Lee. Visit Bruce Lee's Grave Site.